The above is an example of such things. The two new things are the notebook and blanket. 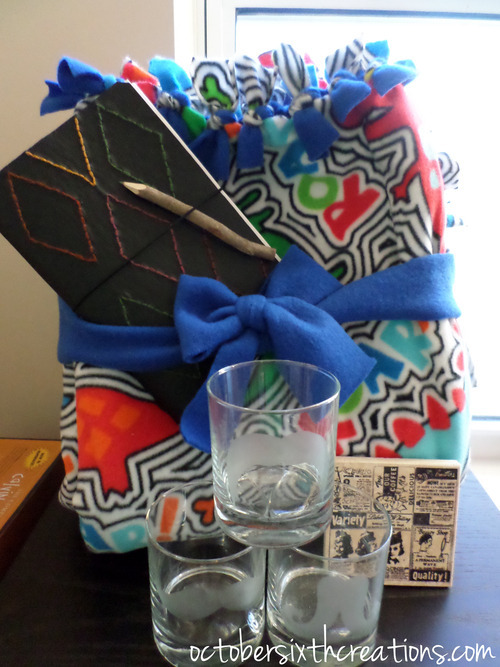 The glasses and coaster were added things to increase the gift appeal. This was used for a white elephant gift exchange that my husbands work was having with their student staff. I like then the kids fight over my stuff. I thrive off of the number of steals my gifts get. Adult Size Dinosaur Fleece Blanket. Dino front and blue back. I use two yards for for adult size. Travelers Notebook plus pencil. I did not wittle the pencil. I did make the notebook. Tile turned coaster. Done with a stamp. Coated with varnish of course. What stuff do you have hanging around your house? Can you make it into something to give?